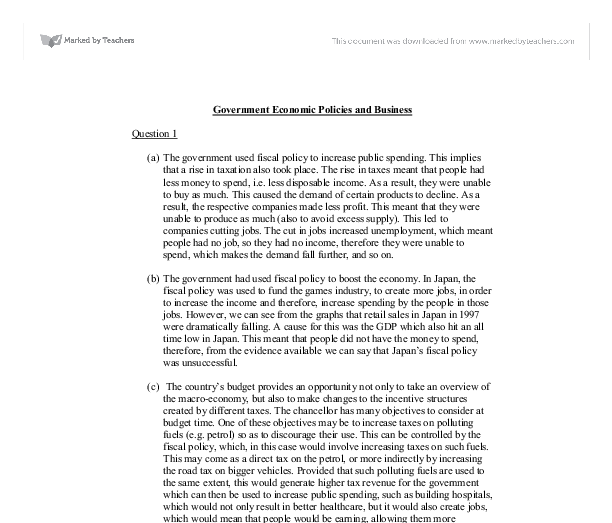 Government Economic Policies and Business Question 1 (a) The government used fiscal policy to increase public spending. This implies that a rise in taxation also took place. The rise in taxes meant that people had less money to spend, i.e. less disposable income. As a result, they were unable to buy as much. This caused the demand of certain products to decline. As a result, the respective companies made less profit. This meant that they were unable to produce as much (also to avoid excess supply). ...read more. In Japan, the fiscal policy was used to fund the games industry, to create more jobs, in order to increase the income and therefore, increase spending by the people in those jobs. However, we can see from the graphs that retail sales in Japan in 1997 were dramatically falling. A cause for this was the GDP which also hit an all time low in Japan. 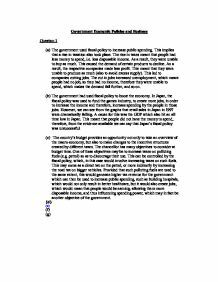 This meant that people did not have the money to spend, therefore, from the evidence available we can say that Japan's fiscal policy was unsuccessful. ...read more. This may come as a direct tax on the petrol, or more indirectly by increasing the road tax on bigger vehicles. Provided that such polluting fuels are used to the same extent, this would generate higher tax revenue for the government which can then be used to increase public spending, such as building hospitals, which would not only result in better healthcare, but it would also create jobs, which would mean that people would be earning, allowing them more disposable income, and thus influencing spending power, which may in fact be another objective of the government. (d) (e) (f) (g) ...read more. Figure 7.0 - Cost push inflation The final explanation of inflation is the Monetarist theory. Monetarists believe that inflation is demand-pull nature and that the sole cause of inflation is a rise in the money supply. Milton Friedman once said "Inflation is always and everywhere a monetary phenomenon". This without a doubt makes it one of the government's main priorities, the latest example of this being Labours intention to raise the minimum school leaving age to 18, by offering apprenticeships, college courses, or work based training to every child.